These complaints may be the result of a VESTIBULAR DISORDER. Vestibular disorders can cause disequilibrium presenting as imbalance, unsteadiness, falls, near falls, staggering, stumbling, veering or lack of “surefootedness.” Vestibular disorders may also be accompanied by headaches, neck and back pain, increased motion sickness, nausea, increased sensitivity to noise and bright lights, difficulty with vision especially in areas of low lighting or full field stimulus (busy carpets, clutter, busy wallpaper, heavy traffic areas). independent Home Exercise Program of static, dynamic and ADL-incorporated challenges to the Vestibular system. Vestibular Rehabilitation Therapy is designed to provide small, controlled doses of movements and activities that provoke dizziness and/or unsteadiness in order to 1) desensitize (habituate) the balance system to the movement and 2) enhance the fine-tuning of the VOR and VSR involved in long-term compensation. In setting treatment programs, we work with the three-part system: Eyes, Ears, and Feet. Progressing challenges helps them develop “patterned responses”. A vestibular evaluation includes a look at the way the eyes move, to be sure they do what you command them to do. Abnormal vision can be a small part of dizziness. We also look at your balance systems for deficits that may be contributing to unsteadiness in the ankles, legs and trunk. Often a Dynamic Gait Index is performed to assess limitations in walking function. Most importantly, an evaluation of the inner ear is done to assess the most common cause of vertigo. The sensation of spinning, unsteady vision and nausea associated with specific kinds of movement usually defines an inner ear dysfunction. Very specific movements are performed to provoke and then to treat the condition known as Benign Positional Paroxysmal Vertigo. Your symptoms will already begin to abate and you can generally expect to be completely better within 2 weeks. A home exercise program will need to be done daily and the benefits will obvious. According to the NIH, 90% of all causes of dizziness can be found through evaluation and 85% of all cases are caused by disturbances in the inner ear. STATISTICS: Dizziness will occur in 70% of the US population at some point in their lives. Over 90 million Americans, 17 and older, have already experienced problems related to dizziness or imbalance. Medical care costs for patients with dizziness and balance disorders has been estimated to exceed $20 billion per year. It’s difficult to diagnose with standard tests: Vestibular Neuritis does not show up on MRI, CTScan, blood work…, the inner ear is encased in dense bone and cannot be imaged by otoscope. “Dizziness” is now the most common complaint of patients over 75 years old. Most common cause of vertigo due to Peripheral vestibular disorder; occurs spontaneously but can follow head trauma, vestibular neuritis, labyrinthitis or ischemia in the distribution of the anterior vestibular artery. Brief episodes of vertigo are induced by change in head position, caused by the incidental displacement of otoconia from the utricle into one of the SemiCircular Canals (SCC). 39% of etiology is unknown, less than 50 years of age is usually due to mild to severe head trauma, (sports, amusement rides, falls…), greater than 50 years of age can be related to infarction, impaired circulation, aging, dehydration. 2nd most common cause of vertigo, due to viral infection (suspect Bell’s Palsy, herpes, cold sores, shingles, Lymes), swelling may cause permanent damage to the vestibular nerve. In the acute phase dizziness is constant and not relieved with positional or visual fixation. You may have to wait for acute sx to settle down. The brain can learn compensation strategies with visual and somatosensory education. Therapy is not a cure for a balance disorder, but simply a management technique. 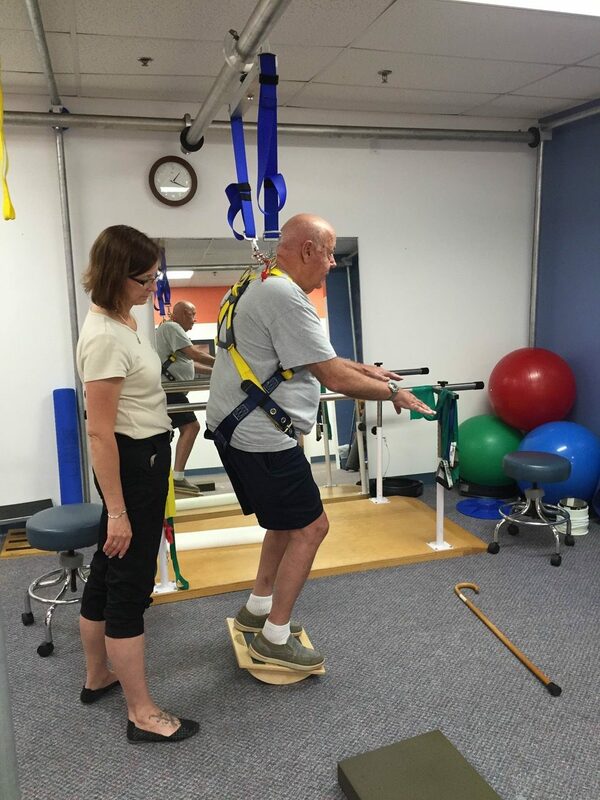 Physical Therapy utilizes a number of tests to determine the extent of a vestibular deficit and determine the most appropriate course of treatment. Visual: oculomotor control of location of fovea. Vestibular: SCCs detect pitch, yaw, and roll; Saccule detects vertical movement; utricle detects horizontal movement. Vestibulo-Occular Reflex: visual stability during head or body movement, head moves and eyes stay fixed (peripheral function) i.e. dancer or skater. Head Thrust: abrupt rapid linear head movement while eyes stay fixed (peripheral test). Dynamic Visual Acuity: reading a Snellen chart while head is moved. Vestibulo-Somatic Reflex: using somatosensory input from extremities for balance with ankle strategy, hip strategy, step strategy. Static Control: Rhomberg Test looks at visual dependence with Eyes Open (EO) and Eyes Closed (EC). Modified CTSIB: EO and EC, off and on foam. Dynamic Control: unsolicited gait pattern is most common abnormality with variable BOS, “veering”, “staggering”. “looks a bit drunk.” Fukuda Step Test: progression of Rhomberg with movement now with EO and EC. Dynamic Gait Index: most sensitive to vestibular dysfunction.